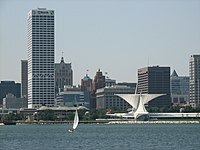 What is the highest point in Wisconsin? Which of these places is north of Wisconsin? Which of the following is South of Wisconsin? Question 6:  Today, public education in Wisconsin includes both the 26-campus ________, with the flagship university University of Wisconsin–Madison, and the 16-campus Wisconsin Technical College System which coordinates with the University of Wisconsin. How many metres above sea level is the lowest point in Wisconsin? What are people from Wisconsin known as? What is directly west of Wisconsin? Who played centre in the Wisconsin?